ABA Bank, the member of the National Bank of Canada Group, officially launches its own online payment gateway for merchants. The service is called PayWay. Being perfectly tailored to the local business needs, PayWay provides secure, convenient and easy-to-integrate solution that helps entrepreneurs sell their products or services online and accept payments instantly. Local conglomerate Royal Group signed a memorandum of understanding (MoU) on Friday to form a new joint venture with South Korea’s largest retailer, E-Mart Inc, to build a hypermarket – a massive retail outlet that combines a supermarket with a department store – in Cambodia. The Ministry of Mines and Energy (MME) and the Ministry of Economy and Finance (MEF) have issued a joint prakas that aims to clarify the procedures and formalities for mineral commodity exports, according to a blog post by Integrity Cambodia, a pro-transparency group covering the Kingdom’s extractive industries. Sihanoukville Autonomous Port (PAS), which operates the Kingdom’s only deepsea port, reported a modest increase in container traffic during the first six months of the year, compared to a year earlier, a trend its director said should result in higher profits for the listed company. 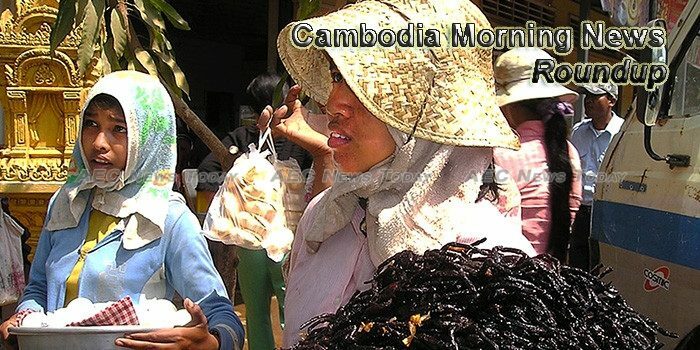 Cambodia’s most important ecosystem is in crisis, experts say. Millions rely on the Tonle Sap lake for food and irrigation, and its destruction would have repercussions across the whole Kingdom. What can be done? An ancient statue was unearthed near the one-time imperial capital of Angkor Thom on Sunday by researchers studying an Angkor-era hospital nearby, the Apsara Authority announced yesterday. Police are searching for four suspects believed to have carried weapons illegally across the Thai border in a case in which three Cambodians and six Thais were arrested last month for alleged weapons trafficking, a Banteay Meanchey police official said on Monday. Four men, including a Frenchman and a Cameroonian, were arrested in Poipet City for attempting to take cash from a man with the promise of duplicating the notes, police said. Hundreds of riverside families in Tbong Khmum province were on Monday evacuated away from the flooding Mekong River, even as the provinces hit hardest by tropical storm ‘Sonca’ last week returned to normalcy and evacuees shuffled back to their homes. On July 8th, the Cambodian American community of Washington State hosted U.S. Ambassador William Heidt and family, which culminated in a dinner reception honoring his visit. The Cambodian American Community Council of Washington (CACCWA) hosted the event which was part of a weekend tour that included a visit to the oldest Khmer Buddhist temple in Washington State, a reception at China Harbor, and a private lunch at the residence of one of its members. The visit was an opportunity for the Cambodian American community of Washington State to get to know the highest ranking diplomat representing the United States in Cambodia.